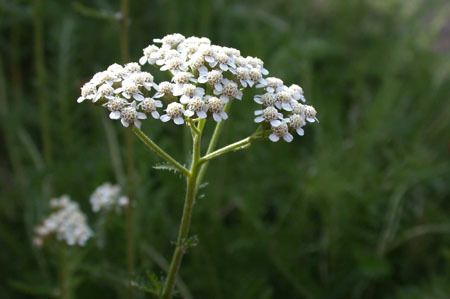 A. millefolium is an erect, herbaceous, perennial plant that produces one to several stems 0.2–1 m (0.66–3.28 ft) in height, and has a spreading rhizomatous growth form. Leaves are evenly distributed along the stem, with the leaves near the middle and bottom of the stem being the largest. The leaves have varying degrees of hairiness (pubescence). The leaves are 5–20 cm (2.0–7.9 in) long, bipinnate or tripinnate, almost feathery, and arranged spirally on the stems. The leaves are cauline, and more or less clasping.